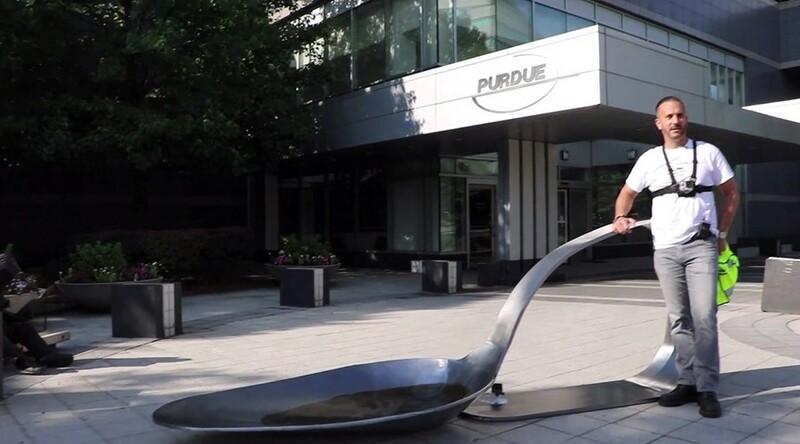 A man has been arrested for installing a 10-foot-long, 800 pound heroin spoon sculpture outside of Purdue Pharma’s headquarters, in a defiant demonstration against the OxyContin producer. Fernando Luis Alvarez arranged for the piece to be dropped outside Purdue – a major manufacturer of opioids – on Friday (June 22). The steel creation was made by Boston artist Domenic Esposito, a sculptor, who told Hyperallergic that it was inspired by his own brother’s battle with heroin addiction. Alvarez was arrested and charged with a criminal misdemeanour and a felony, according to TIME. He plans to erect more of the heroin spoon sculptures outside of similar companies. This statement coincides with an exhibition at gallery owner Alvarez’s space in Stamford, Connecticut, about the opioid crisis. Purdue Pharma makes several different opioids, as well as OxyContin. The company has faced a series of lawsuits alleging it has engaged in improper prescribing practices that encourage patient misuse. A 2007 suit saw Perdue pay out $600 million for criminal misbranding on how addictive the drug is. As Reuters reports, Purdue denies various claims, and has cut down its sales force and stopped promoting the drug. The artist Nan Goldin founded the artist and activist group PAIN earlier this year, which has challenged the Purdue-owning Sackler Family. The Sacklers are major patrons to the arts, funding the V&A, Oxford University, the Serpentine, and other institutions. Goldin previously opened up about her own struggles with addiction, and staged a protest at the Sackler’s Wing of the Metropolitan Museum. The huge heroin spoon sculpture has been seized by authorities, but Alvarez intends to drop more outside the offices of politicians, doctors they believe are involved in the epidemic, and other companies. 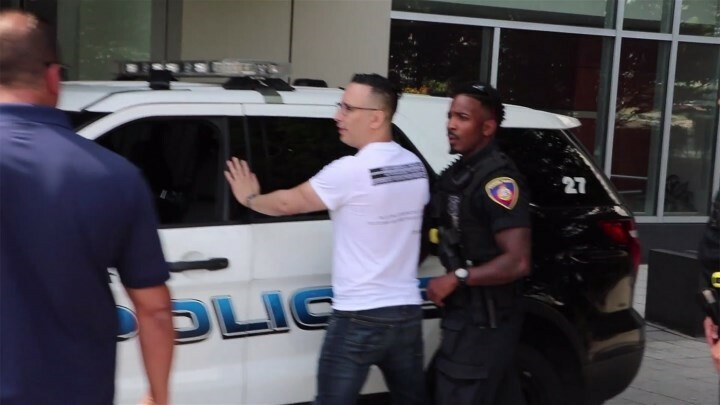 Works by Esposito and other artists responding to the opioid crisis are on display at the exhibition Opioid: Express Yourself, which is showing at the Alvarez Gallery in Stamford, Connecticut, until July 30.